Passover is perhaps the most family-oriented of Jewish holidays. As we sit around our tables, we retell the story of our exodus from Egypt and our journey to freedom. We remember as if we ourselves left Egypt. We honor our freedom but take time to remember our past hardships. We celebrate our liberation, our vibrant history and look ahead to the promise of the future. It is this commitment to living true to our fundamental Jewish values, remembering when we were strangers in a strange land, and living a meaningful Jewish life that is the very heart and soul of Ohav Shalom. In this season, as much as ever, we ask that you acknowledge our ability to grow stronger as a congregation by showing your support just as we were bolstered by communal fortitude during our exodus. Please visit our donation page to easily make donations online. In honor of Passover, we’ve included a sale on all Tree of Life Leaves and Pew Plaques. I wish you and your family a joyous Passover and thank you for your support to help our congregation continue to go from strength to strength. Note: leading halachic authorities have ruled that online authorizations are acceptable for the purpose of selling chametz. Passover, or Pesach in Hebrew, is one of the three major pilgrimage festivals of ancient Israel. Originally a combination of a couple of different spring festivals, it is a commemoration of the Exodus from Egypt, especially the night when God “passed over” the houses of the Israelites during the tenth plague, and of the following day, when the Israelites had to leave Egypt hurriedly. Centered on the family or communal celebration of the seder (ritual meal), Passover is one of the most beloved of all Jewish holidays. The origins of Passover lie in pre-Israelite spring celebrations of the first grain harvest and the births of the first lambs of the season. Within a Jewish context, however, it celebrates God’s great redemptive act at the time of the Exodus, leading the Israelites out from slavery in Egypt to freedom. Together with Shavuot (the Festival of Weeks) and Sukkot (The Festival of Booths), Pesach is one of the ancient Israelite pilgrimage festivals, during which adult males journeyed to the Temple in Jerusalem to offer sacrifices and bask in the divine presence. Since the destruction of the Second Temple in 70 CE, the focus of Pesach celebration shifted to the ritual meal, called the seder, that takes place either in the home or in the community. In anticipation of Pesach, it is traditional to engage in a thorough spring cleaning. During the holiday, Jews’ food reflects the major theme of Passover, reliving God’s great redemptive act, albeit in a vicarious manner. Because the Israelites had no time to let their bread rise, Jewish law forbids eating (or even possessing) any food that can contain leaven. Therefore, a major part of the preparations for Pesach consists of removing all traces of leavened foods from the home and replacing them with unleavened foods (though many Jews prefer to “sell” their unused leaven products to a non-Jew for the duration of the holiday). This necessitates both a massive cleanup and the replacement of one’s ordinary dishes with special Pesach ones. It also requires a shopping expedition to stock the kitchen with special Passover-kosher foods. The overarching theme of Passover is redemption. After all, this is the holiday that celebrates God’s intervention in history to lead the Israelites from slavery to freedom. It is a time to celebrate God as the great liberator of humanity. The divine redemption of the Israelites thus becomes the blueprint for the Jewish understanding of God and divine morality and ethics, which can be seen in Jewish participation at the forefront of movements for social justice. Although the focus of Passover observance is on the home, it should not be forgotten that Pesach is a holiday, on the first and last days of which traditional Judaism prohibits working. There are special synagogue services, including special biblical readings, among which one finds Shir ha-Shirim, “The Song of Songs” and Hallel, Psalms of praise and thanksgiving for God’s saving act in history. The last day of Passover is one of the four times a year that the Yizkor service of remembrance is recited. Pesach is usually marked as a family celebration of Jewish freedom. Although the central ritual of this festival is the home seder, there are a number of rituals that are observed within the wider community. In the six weeks preceding Passover, there are a number of special Sabbaths, during which additional or special biblical readings are included in the service. The readings and special days relate to purification rites (Shabbat Parah), the month of Nisan in which Passover falls (Shabbat Ha-Chodesh), or a time to request instruction on the observances of the upcoming festival (Shabbat HaGadol). Finally, the day just before Passover is one of the minor fast days of the year. Called the Fast of the Firstborn, it is for firstborn males to commemorate the fact that no Jewish firstborn males were killed when the Angel of Death visited the homes of the Egyptians. One of the ethical components of Passover is called Ma’ot Chittim, literally “money for wheat.” It is a tax imposed on the congregation in the period leading up to Passover to raise money so that the poor can buy wheat to bake matzah and buy other special foods required for the festival. Even though most congregations would not formally impose such a tax, it is very common in Jewish communities throughout the world to carry on with this custom by raising money or sending out Passover food baskets for the poor. The first and last days of Passover are full festival days, when traditional Jews do not work. Traditional Jews outside of Israel observe the first two and last two days as full-festivals, while in Israel and among liberal Jews worldwide, it is just one day at each end of the festival. The synagogue services of Passover begin with the evening service prior to the seder. A unique feature at this festival service is the omission of the kiddush (blessing over the wine). On Passover it is assumed that even the poorest will have wine or be invited to a home where kiddush will be recited at the seder. The morning service of Passover is distinguished by the reading of the excerpt from Exodus chapter 12 that discusses the Passover celebration. The traditional haftarah (prophetic) reading is from Joshua chapters 5 and 6, which contains the first mention of the Passover festival in the prophets. Hallel is recited as part of the service. On the last days of Passover only a shortened version of Hallel is recited. One of the special additions to the first-day Passover service is the prayer for dew, “Tefillat Tal.” This parallels the prayer for rain recited during the Fall holiday of Shemini Atzeret . On the Sabbath that falls during Passover, the special reading is Shir ha-Shirim (Song of Songs), one of the megillot or five scrolls. The Torah reading contains parts of either Exodus 13, 14, or 15, depending on the particular synagogue’s tradition. It is the story of the crossing of the Red (Reed) Sea. The haftarah is from Second Samuel 22, another prayer of deliverance. This time David is beign saved from the hand of Saul. The last day of Passover is one of the four times of the year we recite Yizkor, the memorial service for the dead. The counting of the Omer (“Sefirat Omer“) commences on the second night of the holiday. Omer was the measure of barley brought to the Temple on the second day of Passover as an offering for the beginning of the harvest. The days will then be counted publicly for seven weeks (a week of weeks), which culminates on the 50th day with Shavuot . The intermediate days of Passover, called “Hol ha-Moed,” are semi-holidays, on which Jews are permitted to work. Traditionally, the Torah is read in the synagogue every morning of Passover. The haftarah for the intermediate days is from Ezekiel 37, which contains the vision of the dry bones being resurrected by God. Passover is truly one of the richest and most profound of Jewish festivals, combining historical and agricultural symbols, practices, and rituals, which together constitute a holiday that is a treasure box revealing layers upon layers of significance. The central ritual of Pesach is the seder, a carefully choreographed ritual meal that takes place either in the home or in the community. A number of symbolic foods are laid out on the table, of which the most important are the matzah, the unleavened “bread of affliction,” and the shank bone, which commemorates the Pesach sacrifice in the Temple. The sederfollows a script laid out in the Haggadah, a book that tells the story of the redemption from Egypt and thanks God for it. Although the Haggadah is a traditional text, many people–particularly in the modern world, add to it and revise it in accord with their theology and understanding of God’s redemptive actions in the world. The Passover seder (meaning order) is probably the most celebrated and beloved of Jewish home rituals. Most Jews have cherished memories of past family times spent at a seder. It is believed that the obligation to tell the story of the Exodus was observed by Jews’ ancestors ever since the actual Exodus itself. The scriptural command (Exodus 13:8) to tell the story of the exodus to our children is interpreted as a positive commandment (mitzvah). One of the four names for Passover, and sometimes the aspect most emphasized, is Hag ha-Herut (The Feast of Freedom). Freedom is the primary theme of the seder, with numerous other recurring themes and motifs. The seder permits Jews to worship God through prayer, study, and learning by taking part in what is essentially a lesson of Jewish history, literature, and religion. Participation in the seder lets one symbolically and vicariously relive the Exodus, where past and present merge. There are some essential elements to the seder that underlie the retelling of the Exodus. The three fundamental patterns of the seder are the family, the individual, and the nation. As a home event involving the full family as well as guests, the sederdraws together all age groups. It requires the participation of the old and the young. On the individual level, the seder requires every participant to feel as though he or she personally left Egypt. The national pattern of the seder symbolizes the first step toward the final redemption from the slavery and the formation of the Jewish nation that did not exist as a nation before Exodus from Egypt. In order to tell the story, Jews have created an ingenious work of pedagogy. The “script” for this central ritual of Passover is the Haggadah (literally, “telling”). It contains questions and answers, stories, show and tell, song, food as reward and symbol, pathos, and suspense. The creation of this script took place over hundreds of years at the beginning of the Common Era. There is evidence that parts of the seder were in a fixed format by the time of the Mishnah (second to third century CE). Midrashim were added and the current traditional version was fixed soon after. Because every generation has managed to find its own significance in this wonderful teaching tool, there is now a plethora of Haggadot with added stories, songs, games, and pictures, to suit every political, spiritual, and religious point of view. You can now find liberal, mystical, feminist, ecological and children’s Haggadot. The seder takes place following the Passover evening synagogue service on the first two nights of Passover (or just the first night in Israel and among liberal Jews worldwide). The seder is supposed to take place with everyone in a reclining position. This is because slaves ate hurriedly; the affluent and free were able to recline on cushions. On erev Pesach (Passover eve), rich and poor are indistinguishable and all are free and thus privileged to recline. Many families have the tradition of placing pillows on each chair or at least having the seder leader follow this practice of reclining. It is also customary for the chief celebrant to wear a white robe called a kittel. There are a number of symbols that occur throughout the seder, but perhaps the focal point of the whole event is the sederplate. It contains a roasted shank bone, symbolizing the Pesach sacrifice in the Temple, a roasted egg symbolizing either the spring season or mourning (for the destruction of Jerusalem), maror (bitter herbs) to represent the bitter experience of the Hebrew slaves, haroset (a mixture of apples, nuts, raisins, spices, wine) symbolizing the mortar the Hebrew slaves used to build for the Egyptians, and karpas (parsley, celery, or another green vegetable) symbolizing the green of spring. The table must also have three pieces of matzah, each piece used for a different purpose, usually held in a special pouch made to be used during the seder. The seder service has a clear order, with each of 14 steps representing a different phase of the seder. Together, they serve to teach the lesson of the Exodus, God’s saving the Jewish people from slavery. Much of the seder discussion focuses on God’s might and the Divine role in redemption. 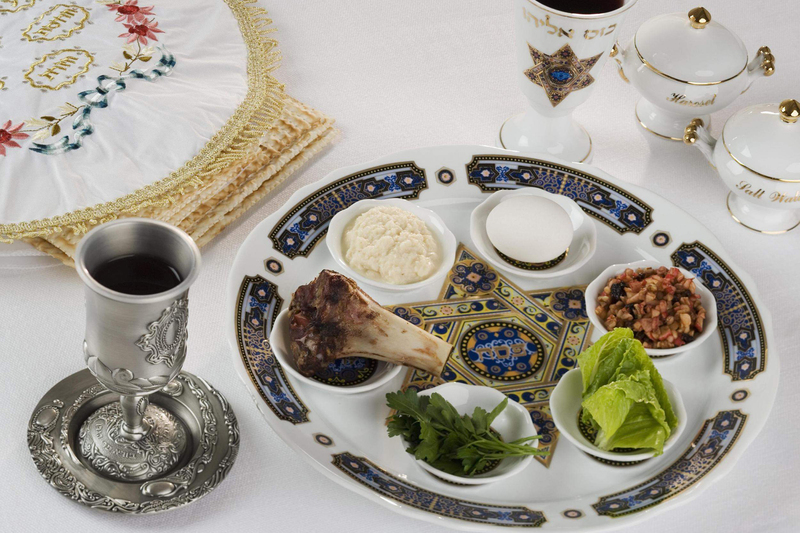 There are many instances of the number four throughout the seder: four cups of wine, four sons, four matriarchs, four names for Pesach, four Aggadot, four blessings, four types of food on the seder plate. The most well-known example is the Arba Kushiyot, or four questions. These questions, usually recited by the youngest person at the table, are meant to highlight the main differences between this meal and all other meals of the year. They are also a brilliant way of keeping young people interested and involved in the events of the seder. They include queries about why we recline, why we dip food, and why we eat certain types of food. Another special part of the seder is the extra cup of wine left on the table for Elijah. The suspense and excitement engendered by sending a child to open the door for the prophet who will be a harbinger of messianic times is almost electric. The chanting of the song Dayenu (“it would have been enough”), a joyous recognition of God’s numerous gifts to us in the course of the Exodus, is another highlight. Every Jew will have his or her own special memories of a past family seder, but it is unquestionably among the greatest of our yearly rituals.